Guitar straps are particularly important since they keep your valued instrument safe against accidental fall. These are strong accessories that can prolong the life of your guitar and can offer more comfort. 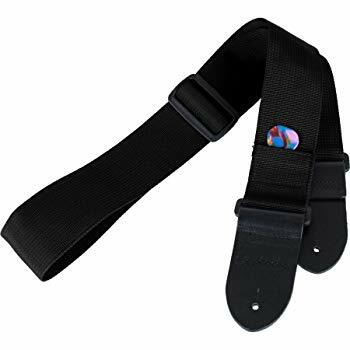 When chosen carefully, acoustic guitar straps take off extra weight from your shoulders and make guitars more playable and certainly more comfortable to hold. In fact, it is a good habit to use acoustic guitar straps from the beginning. They help a great deal in learning how to properly hold your instrument. Moreover, they certainly increase the style quotient. 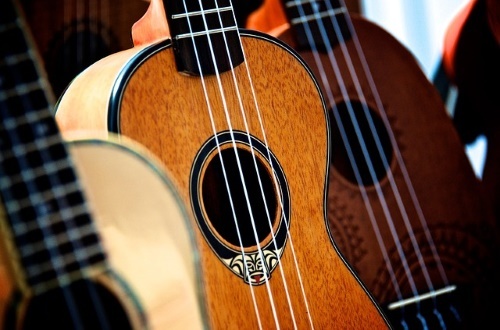 Guitars are of different types and have different features. A good guitar accessory is the one that perfectly complements the features of your instrument. It also holds true for guitar straps too. Keeping in mind all such needs and differences, we have made a list of 5 unique acoustic guitar straps that are a perfect mixture of quality and budget. This acoustic guitar strap by Protec is made of high-quality nylon. Its combination locks are adjustable and resettable, and have a chromatic nickel finish. It is manufactured for acoustic guitars with 2 strap buttons. In addition, with non-abrasive and dustproof hardware, this guitar strap has leather ends. The Protec Guitar Strap features a Pickpocket and is fully adjustable. Lastly, it is 2 inches wide. If you’re learning how to play guitar, this inexpensive acoustic guitar strap by Protec is just what you need. Usually recommended for beginners, it isn’t designed to support heavy high-end acoustic guitars. Other than this, this acoustic guitar strap is a value for money option. This high-quality acoustic guitar strap by Planet Waves is made of pure leather. Its length can be adjusted anywhere between 44.4 inches to 53 inches. It is 2.5 inches wide and has a tapered finish that prevents the strap from twisting. In addition, this strap is strong enough to support all high-end guitars for all music styles. Lastly, it is available in 5 different colors – brown, black, blue, red, and white. The colors are priced differently. 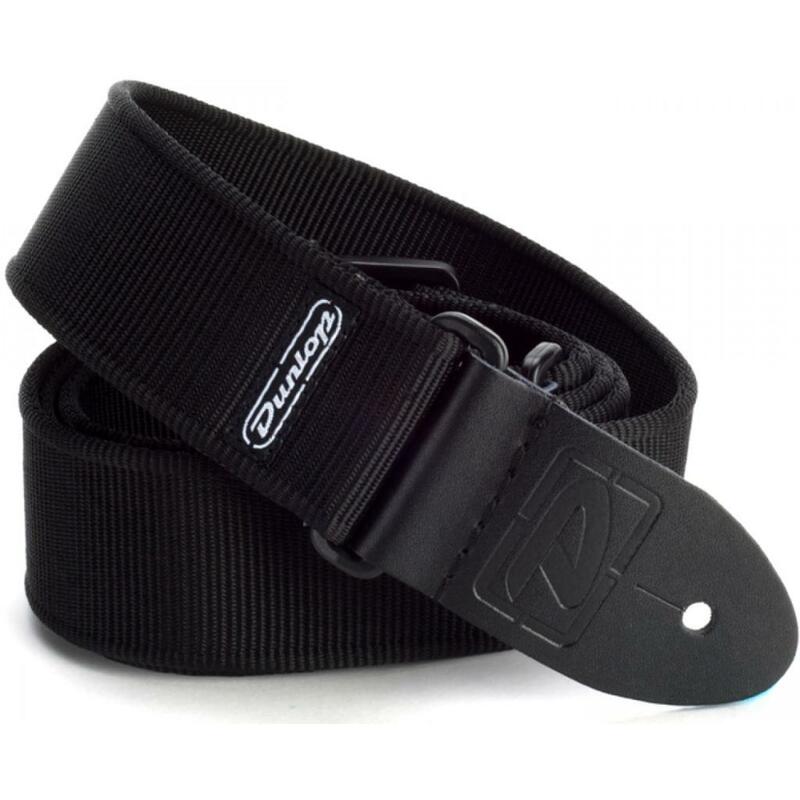 Planet Waves Basic Classic Leather Guitar Strap is strong enough to be used during live stage performances. It supports almost all music styles. However, the shoulder rest doesn’t fall properly over the shoulders if you’re tall. Other than this, it is a premium quality leather strap for acoustic guitars of all kinds. This comfortable acoustic guitar strap comes with adjustable buckles and can support heavy guitars. It is 2 inches wide and its length can be adjusted anywhere between 38 inches to 65 inches. 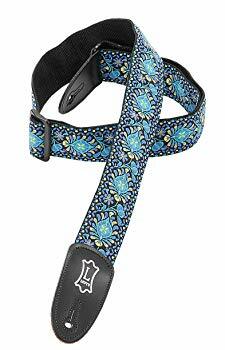 This stylish guitar strap sports jacquard woven and poly woven designs. This all nylon guitar strap by Dunlop has leather ends and it weighs 4.8 ounces. Lastly, it supports almost all music styles. Dunlop D3809BK Solid Black Strap does what it says. It looks stylish, is durable, and holds all acoustic guitars too well. 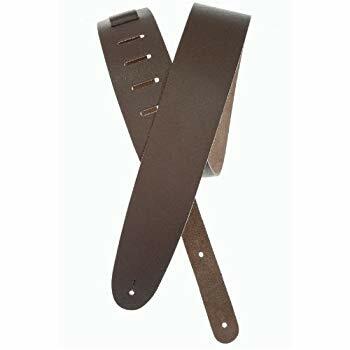 However, the leather ends of this strap are very stiff. For this reason, we’d recommend that you run a manual check to get the feel of the strap against your fingers and shoulders. This acoustic guitar strap is 2 inches wide and displays a stunning jacquard weave pattern. It can be adjusted up to 54 inches and is available in 17 different colors. This acoustic guitar strap can hold lightweight guitars for blues, jazz and folk music. In addition, with a polypropylene backing, this lightweight guitar strap is also available in XL size, 68 inches. Levy’s Leathers M8HT-04 is a neatly stitched guitar strap and weighs 4.8 ounces. Lastly, it sports leather ends. Unlikely of a guitar strap, this strap by Levy’s does emit a foul smell that may linger for first few days. It is strong and sturdy, but the end holes are too tight to be installed easily. However, they loosen up a little over time. Overall, this is a value for money inexpensive acoustic guitar strap for inexpensive guitars. This vintage style acoustic guitar strap displays a beautiful tweed pattern. It is 2 inches wide and can be adjusted anywhere between 44 inches to 44.9 inches. It has stylish leather ends with a fender logo engraved for a stylish look. In addition, with a great finish and neat stitch, this acoustic guitar strap by fender weighs 1.6 ounces. This yellow colored vintage style strap by fender is inexpensive. Lastly, it is durable and long-lasting. 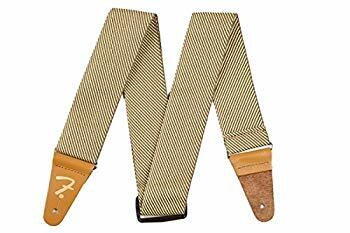 Fender 2 Vintage Tweed Acoustic Guitar Strap is basically designed for beginners and intermediates. It isn’t ideal for high-end guitars. This is because the ends are too thin to support such guitars. Also, the end holes are stiff. However, this shouldn’t be an issue for beginners because the strap holes lose some rigidity with time. 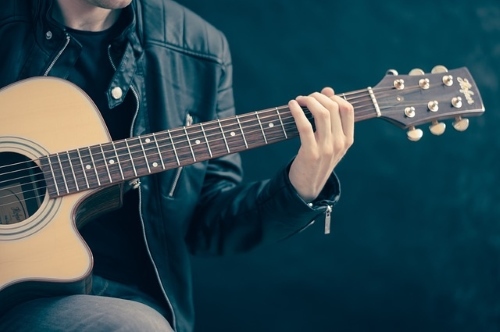 An Acoustic guitar strap is an extra layer of protection for stringed instruments. Nathless, their value doesn’t just limit to being a shield that prolongs a guitar’s life. They are also useful in a number of other ways. For this reason, you should value some features more than some others. Strap Width – A wider strap is naturally more comfortable than a narrow one. Additionally, the lesser the strap slides, the better it is. Material – Other than being strong, the strap material should be as soft as you can possibly afford. The softer material does not dig against the skin. Adjustment Level – An acoustic guitar strap that can be shortened and lengthened at will is far better. Such a strap is also valuable in the long run as you gain height. Strap Ends – Ideal guitar straps should have flexible end holes for easy installation. Though, even if stiff, the leather ends should be strong enough to support the weight of your instrument. 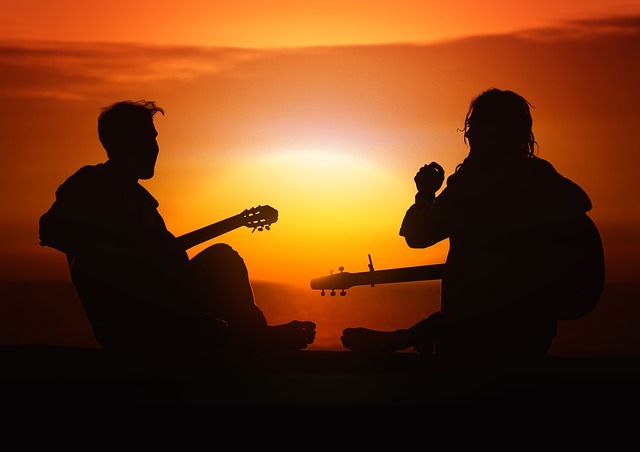 Strength – Not all acoustic guitar straps are equally strong. Thus, always choose a strap that can support the weight of your instrument. Length – Almost all good quality guitar straps have an adjustable length. However, you should still buy the one that’s closest to your profile in order to avoid future disappointment. Your Budget – If you have a low budget, you should buy nylon made guitar straps. In case your budget is higher, you should buy leather straps. Even cotton straps are a good option. Protection And Comfort – You should always buy padded straps for high-end guitars. These straps are comfortable and quite strong. Additionally, they slide less that offers more protection. In the end, guitar straps aren’t just a styling accessory. Instead, they are necessities. They are important for performers as well as learners. However, despite the variety, some straps are more useful than some others. This is because the usefulness of a guitar strap depends upon your requirements. Hence, our list of 5 best acoustic guitar straps will certainly help you in the long run. 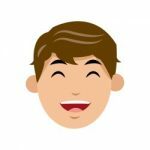 Damilolai has been writing about music for the past 7 years before joining musicgroupies.com team. When he's not working he loves going to the park with his two Jack Russell Terrier's Joe and Bells. musicgroupies.com is a participant in the Amazon Services LLC Associates Program, an affiliate advertising program designed to provide a means for sites to earn advertising fees by advertising and linking to Amazon.com. *Amazon and the Amazon logo are trademarks of Amazon.com, Inc., or its affiliates. Additionally, musicgroupies.com participates in various other affiliate programs, and we sometimes get a commission through purchases made through our links.